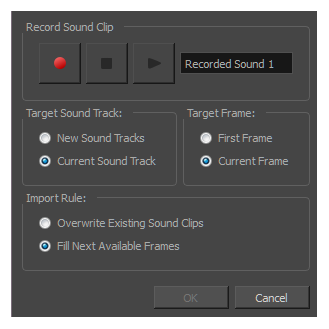 The Record Sound dialog box lets you record sound directly in Storyboard Pro and insert it on the Timeline. Lets you record, play/stop and name your sound recording. Places the recorded sound clips on a new audio track. Places the recorded sound clips on the current audio track. Places the recorded sound clips starting on the first frame. Places the recorded sound clips starting on the current frame. By default, when you recorded a sound, it will replace sounds that exist in the target frames. Places the sound clip into the first available empty frames after any existing sound selection.